Bathed in simulated Earth-shine, space shuttle Atlantis comes to life in its new $100 million exhibit opening Saturday, June 29 at NASA's Kennedy Space Center Visitor Complex. 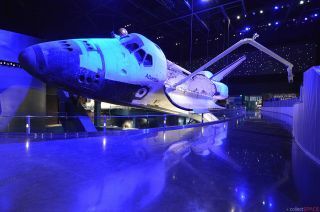 There is a moment in the new Space Shuttle Atlantis exhibit at NASA's Kennedy Space Center Visitor Complex when a fantasy becomes reality and the experience is nothing short of magical. Unlike the theme parks in nearby Orlando, Fla., the attraction here is not the make believe, but the recognition that what you are looking at is in fact real. "Space Shuttle Atlantis,"which debuts on Saturday (June 29), showcases the retired winged spacecraft as part of a $100 million exhibit that has been more than a year in the making. It succeeds in bringing the public nose-to-nose — and nose-to-wing and nose-to-tail — with Atlantis in a way that is unique to every other museum display of a shuttle orbiter. In California, New York and Virginia, NASA's other retired shuttles are all displayed, at least for now, on or near the ground in a horizontal orientation. Atlantis has been raised 30 feet (9 meters) into the air and angled 43.21 degrees to one side. The effect is that the bird is back in flight, or so it appears, yielding views that only a handful of astronauts in orbit were lucky enough to see. With its payload bay open and a replica of its Canadarm robotic arm extended, Atlantis looks less like a museum's static display than it does a still active vehicle, somehow frozen in place, as if it could soar back into orbit at any time. What's more, thanks to theatrical lighting and a 40-foot-long (12 meters) animated digital backdrop, the orbiter comes alive as the changing hues and resulting shadows stretch across its surface. "This is anything but static," said astronaut Bob Springer, who lifted off on Atlantis in 1990. "Granted, it is not moving, [but] I consider this to be very dynamic." "It is striking to be able to see it from this perspective," he told collectSPACE.com. The exhibit, however, is more than just a space shuttle inside a five-story building — as if that isn't enough — but a well-crafted, interactive tribute to the vehicle's storied 30 years of service. The gateway into the Atlantis exhibit, a 184-foot-tall (56 m) replica of the shuttle's solid rocket boosters and external tank, establishes the scale for the display waiting inside. The "stack" and the sweeping wings of the exhibit building can be seen rising from the horizon as guests travel to the visitor complex. A plaque outside the exhibit's main entrance dedicates the display inside to the space shuttle's workforce: "To all the individuals whose years of dedicated service turned the dream of the space shuttle program into a reality." That theme, a dream turning into reality, and the role that those who worked on the shuttle program had in shaping that legacy, continues as guests proceed along a winding, mural-lined ramp. Iconic photos of the orbiter in flight and detailed close-ups of Atlantis serve as the backdrops for a collection of inspirational quotes from the varied engineers and managers who made the space shuttle possible. At the top of the ramp, visitors enter the first of a series of theaters that help introduce and build an appreciation for the shuttle's history. The gateway into the Atlantis exhibit, a 184-foot-tall replica of the shuttle's solid rocket boosters and external tank, establishes the scale for the orbiter's display waiting inside. The initial film introduces the concept that a simple idea can lead to a machine as complex as the space shuttle. On the screen, actors bring to life some of the meetings and decisions that helped shape the orbiter into the icon it became. Featured, though not explicitly named, is the role that the late NASA engineer Maxime "Max" Fagetplayed in bringing a lifting body spacecraft to flight. This story, which is assisted by the use of state-of-the-art projectors and visual effects, delivers guests to their first encounter with Atlantis. That reveal, the moment when a fantasy becomes reality, is best left to be experienced in-person. As the title of the exhibit implies, space shuttle Atlantis is the star attraction of "Space Shuttle Atlantis." Visitors can walk around, underneath and at times, above, parts of the orbiter, affording a clear view into the payload bay, as well as the thousands of thermal tiles that line the underbelly of the vehicle. Just about the only thing guests can't do is climb aboard. But not to worry, there's an app for that. Or more accurately, there are augmented reality displays, touch screens and interactive simulators for that. Multiple screens enable spectators to virtually peel back the outer walls of the orbiter and look inside. A nearby replica of the shuttle's flight deck offers guests the chance to sit in the commander and pilot seats for a photo opportunity. And a super-stretched "iPad," a 24-foot-long (7 m) touchscreen, puts the facts and figures about the shuttle's 135 missions and 335 crew members at visitors' fingertips. Next to a full-size detailed replica of the Hubble Space Telescope are spacewalk simulators. Using camera-outfitted displays that track guests' hand movements, visitors can try their virtually-gloved hands at upgrading the orbiting observatory or working "outside" a digital International Space Station. Like the Hubble Space Telescope replica though, not all of the experiences inside the Atlantis exhibit are virtual. On the opposite side of the orbiter, guests will find a one-fifth scale mockup of the space station featuring crawl-through modules. Visitors can even go on a "spacewalk," crawling through a 22-foot-long, 32-inch-diameter (6.7 m by 81 cm) clear tube connected to one of the space station's rooms. The transparent pathway is suspended 26 feet (8 meters) in the air. Once "on the ground," guests will find additional exhibits including full-size station modules featuring the COLBERT treadmill (named for comedian Stephen Colbert), the food galley, crew members' sleep stations, and a sit-on space station toilet. Elsewhere on the lower floor, guests can try to "Assemble Atlantis" using a simulator that gives visitors control of the 325-ton crane that was used to stack the rocket boosters and fuel tank with the orbiter for launch. Also on display is the real "beanie cap," or gaseous oxygen vent hood, that topped the external tank on the launch pad. Integrated into the exhibit hall is also the Shuttle Launch Experience, a motion simulator that since 2007 has taken guests through the liftoff of an orbiter and its ascent into space. The ride, which is built into in a separate, but now seamless facility is entered from and exits into the Space Shuttle Atlantis building. The Space Shuttle Atlantis exhibit, which has been open for technical rehearsals and sneak previews over the past week, debuts to the public-at-large on Saturday (June 29). Access to Space Shuttle Atlantis is included with general admission to the Kennedy Space Center Visitor Complex, which runs $50 for adults and $40 for children ages 3-11. A public opening ceremony is scheduled to begin at 9:30 a.m. EDT (1300 GMT), with participation by more than 30 shuttle astronauts — at least one for each of Atlantis' 33 missions into space. NASA Administrator Charles Bolden and Kennedy Space Center director Robert Cabana, both former shuttle commanders themselves, are scheduled to deliver remarks at the event. On Friday and Saturday, astronauts will take part in meet-and-greet question and answer sessions, help lead guests on bus tours of the NASA center and walking tours of the complex's rocket garden, sign autographs and have meals with visitors who make reservations for the premium "Lunch with an Astronaut" program in advance. Click through to collectSPACE.com for a photo preview of the new Space Shuttle Atlantis exhibit.